If you haven’t explored opportunities in the contingent workforce, chances are that “Staffing Firm” conjures up images of entry level gigs that last a couple weeks at best. It’s time to put the myths to rest. Qualified and experienced technical workers can tap into rich opportunities through IT staffing firms. Myth: It’s just a temp job, not a career. Most Fortune 500 companies use contingent workers in some capacity. It’s a great way for these companies to test the waters with new employees, or to quickly ramp up resources on a project basis. As a result, consulting opportunities provide an amazing chance to get your foot in the door at some of the most exciting companies in the world. Myth: Staffing positions are for low-level admins – not highly skilled workers like you. 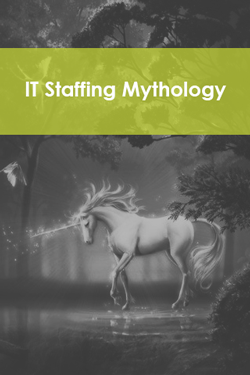 Myth: IT Staffing assignments are too short to offer any job security. IT consulting contracts can last six months, a year, or longer. This gives IT consultants job security for the short term, but long term flexibility. Not to mention that in today’s shifting workforce, a contract assignment has the potential to last just as long as your next permanent position. The opportunity to choose between short term and long term assignments is ideal for recent graduates who want to gain work experience, Baby Boomers who desire flexibility as they enter retirement, and technical experts who enjoy taking on a variety of projects and experiences. Myth: IT staffing firms don’t offer benefits. Technical staffing firms are dedicated to attracting excellent talent, and must offer comprehensive benefits to do so. You can expect to choose from a full selection of benefits that can be tailored to your needs. Health, vision, and dental insurance are just a start. Depending on the contract, consultants may also be eligible for 401k, training, paid vacation, and more. Don’t be put off by the myths that staffing firms are for entry level workers. IT consulting provides technical experts with growth, flexibility, and opportunities to work with the best businesses in the world.